SAN FRANCISCO—The Court Facilities Working Group voted today to recommend that four additional courthouse construction projects in Sacramento, Los Angeles, Fresno, and Nevada City be delayed indefinitely if the Legislature directs that court construction funds be used to finance the Governor George Deukmejian Courthouse in Long Beach. The much-needed Long Beach courthouse is currently under construction and due to open in fall 2013. The project is being delivered under a unique performance-based infrastructure method, authorized by legislation in 2007. Senate Bill 1407, which authorized up to $5 billion in court construction funding through court user fees, passed a year later. “Difficult and devastating as it is to tell more courts that their much-needed and long-awaited projects may not move forward, the branch has a responsibility to proceed with only those projects that we know we can currently afford,” said Justice Brad R. Hill, chair of the Court Facilities Working Group and Administrative Presiding Justice of the Court of Appeal, Fifth Appellate District. “All of these projects are desperately needed, and all residents throughout the state deserve access to justice in courthouses that are safe, secure, and accessible, so these decisions are very painful. The Judicial Council had already voted in October to indefinitely delay seven projects due to budget reductions. The council’s Court Facilities Working Group met today to revisit 23 planned projects because of the potential for another unexpected $550 million that would be needed to accommodate yearly payments for the Long Beach project. The recommendations—which Justice Hill hopes will go before the Judicial Council in January 2013—include: a new criminal courthouse for downtown Sacramento, a replacement for the overburdened courthouse in Huntington Park for the Southeast Court District in Los Angeles, and renovation projects planned for downtown courthouses in Fresno and Nevada City. The draft recommendations include a special direction for the Sacramento project: a recommendation that site acquisition proceed for that project, a $10 million commitment to the developer of the Railyards that would allow the project to proceed as planned when funding becomes available. By fiscal year 2013–2014, nearly $1.5 billion of court user fees originally designated by the Legislature to be set aside for court construction will have been borrowed, transferred to the state General Fund, or redirected to court operations. This year the Legislature directed that $50 million per year be permanently diverted from court construction to trial court operations. The obligation to pay for Long Beach would involve an additional amount of approximately $60 million per year for an annual service payment to the private firm for financing, design, construction, operations, and maintenance of the 31-courtroom courthouse. Paying the annual fee for Long Beach would remove from the court construction account the funds necessary to pay debt-service fees for an estimated $550 million in other court construction projects. During the meeting, courts whose projects were slated for deferral gave presentations and answered questions from the working group. Using the same process that ultimately delayed seven projects last fall, the working group will post the draft recommendations on the California Courts website for two weeks for public comment, then submit finalized recommendations to the Judicial Council for review early next year. 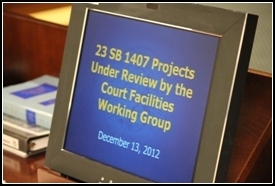 Of the projects originally slated to be funded by SB 1407, eight are proceeding this year, with many of those due to start construction in 2013. The working group is recommending that another 19 projects continue moving forward as funding allows.